Differential sera immunoprofiles of pregnant women with acute ZIKV infection. Multiplex immune profiling of 37 inflammatory cytokines and 32 chemokines using serum specimens derived from 14 LA healthy pregnant women (n = 4–5/trimester) and 30 symptomatic ZIKV+ women (n = 10/trimester). 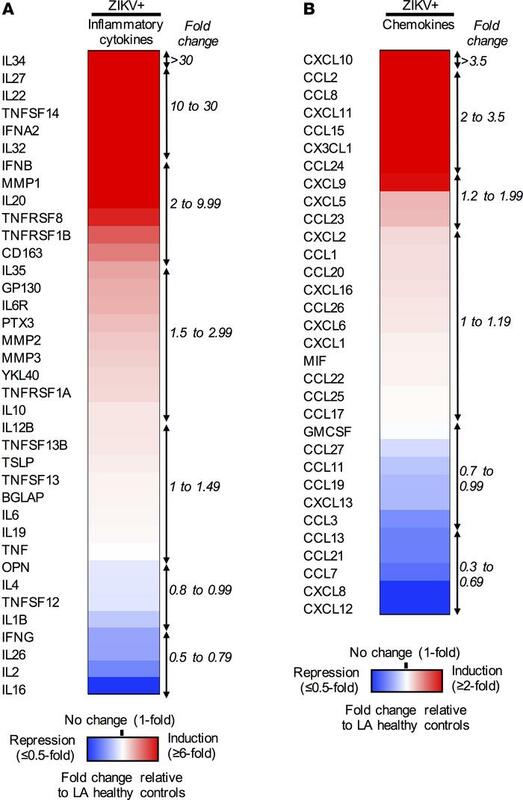 Heatmaps of (A) 37 inflammatory cytokines and (B) 32 chemokines are listed, with fold changes relative to LA healthy controls. Red, white, and blue indicate induction, no change, and repression, respectively.